Gilliam at the 36th Deauville American Films Festival. 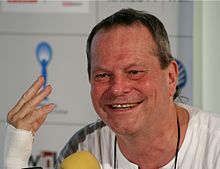 Terry Gilliam (born November 22, 1940) is an American-British cartoonist and filmmaker. He was born in Minnesota and grew up in California, but he now lives in England and is a British citizen. He was a member of the British comedy team Monty Python. He designed animated sequences and acted in both their TV show and movies. He also directed the movies Jabberwocky (1976), Time Bandits (1981), Brazil (1985), Baron Münchhausen (1989), Fisher King (1991), 12 Monkeys (1996), Fear and Loathing in Las Vegas (1998), and The Brothers Grimm (2005). 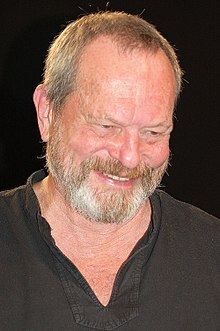 An asteroid, 9619 Terrygilliam, is named in his honor. Awarded the Fellowship of the Kermodes, by film critic Mark Kermode. Director with Unique Visual Sensitivity Award at the Camerimage film festival in Łódź, Poland in 2009. ↑ "2005 FIPRESCI". Fipresci.org. Retrieved 2011-06-01. ↑ "Film Winners in 2009". bafta.org. BAFTA. Retrieved 8 February 2009. This page was last changed on 3 July 2018, at 06:06.